How to manage service type rates? One of the first things any taxi company owner should do is configure his fleet by adding vehicle classes and the rates on which they are allowed to work. This article gives you a clear picture on how the system calculates trip costs. Let’s navigate to tab service types of your company panel. Once you are in “Service types” tab choose “Add service type”, select the necessary “Vehicle class” from the dropdown menu in the pop-up window, choose “Regular” or “Hourly” and press “Next”. 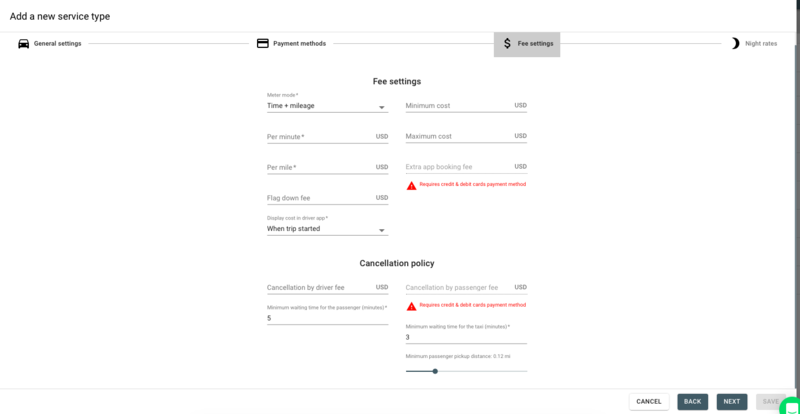 And after Payment methods configuration page you will be transferred to the page with all the possible rate settings. “Regular” and "Hourly" service types tabs settings configuration will be slightly different . Major parameters for a rate cost calculation are displayed in the left-hand column of the new rate window. Please, note that all the fields marked with a star are obligatory and the system won’t allow to save the settings with empty field value. We will now examine every parameter in detail. “Flag down fee” can also be called a “seat price”. In simple words it is a set value for the provision of the cab/service. “Per minute” and “Per kilometer” are the costs set for a minute or kilometer of a ride. 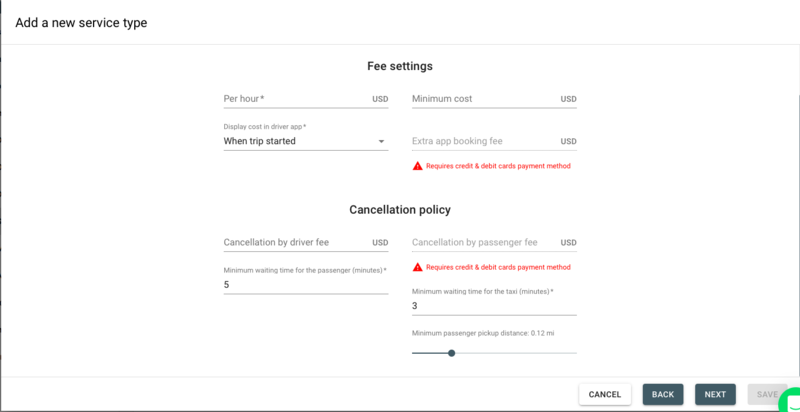 “Minimum” is the minimal cost of the ride which any passenger will be charged for regardless of the trip duration or mileage. 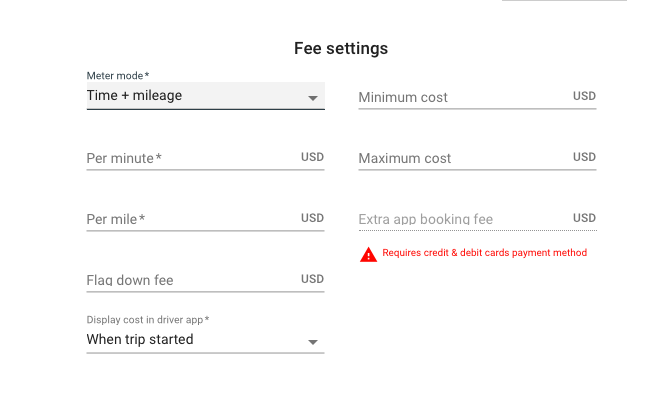 “Maximum” is an optional setting required should there be any regulations in the area for a maximum trip cost. This tab allows you to set the taximeter running in two modes. “Time+ mileage” summarizes the cost of the trip distance and time spent as per the values in per minute/per kilometer fields. In “Time or mileage” mode the system displays an additional required box “Turning point speed” (km/h). The speed value set in this field will be the turning point at which the system switches from counting the ride price per minute (if below the value) to counting per distance (if above the value). Finally, let’s make an exemplary rate setting and go through the calculation process within two different taximeter modes. The selected currency in our company panel is USD. 2km x 0.5$+2.5min x 0.4$+3$=5$ (3$ for the Flag down fee). 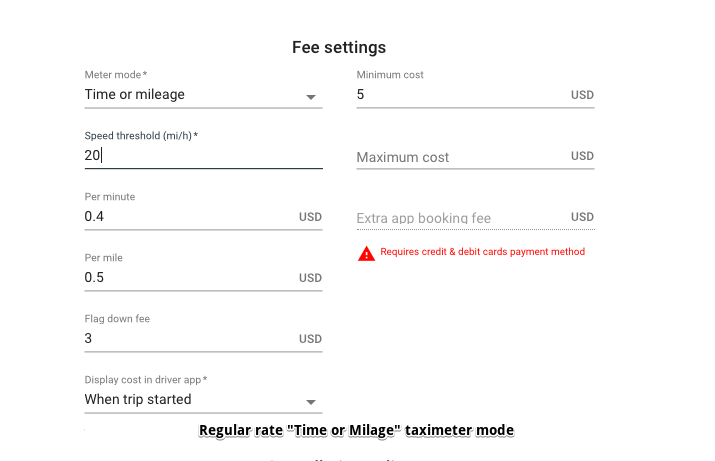 So, this is the point of the ride at which your Minimum is spent and the system will proceed calculating the cost as per the above fees of 0.5$ per kilometer and 0.4$ per minute. In case Flag down fee is higher than Minimum, the system will calculate it as 0 value. 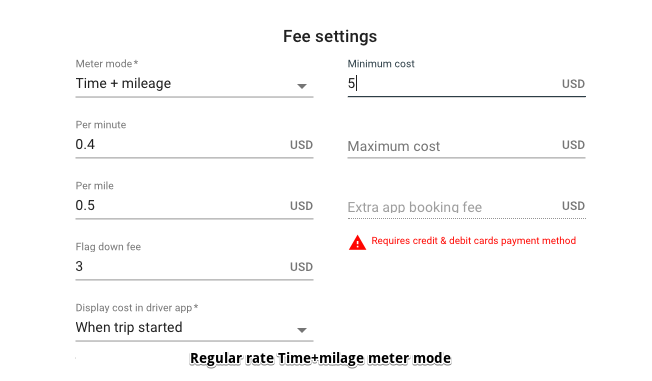 If you set Time or mileage taximeter mode, the system will switch to calculating the trip cost depending on the speed. From the below settings you can see that if it’s less than 20 km/h the calculation will be made per minute value, if over 20 km/h - per kilometer value. Remember that turning point speed minimum is 5 km/h. At the end of the trip the system summarizes minutes and kilometres and calculates the total as showed in the previous example. We hope that the above tips will help you make a more efficient configuration of your service type rates!